Today, Donald Trump met with a bipartisan group of governors to discuss school safety in the wake of the Parkland school shooting earlier this month. I’d like to think that this is an issue the attendants care deeply about, regardless of their political leanings. But it’s hard to believe that’s the case for White House senior advisor Stephen Miller, who showed up to the meeting looking like a sleepy little baby. As you can see in the Getty image above, taken at the event by photographer Chip Somodevilla, Miller gave a classic mid-meeting eye rub at one point, which isn’t damning in itself. (We’ve all been there.) 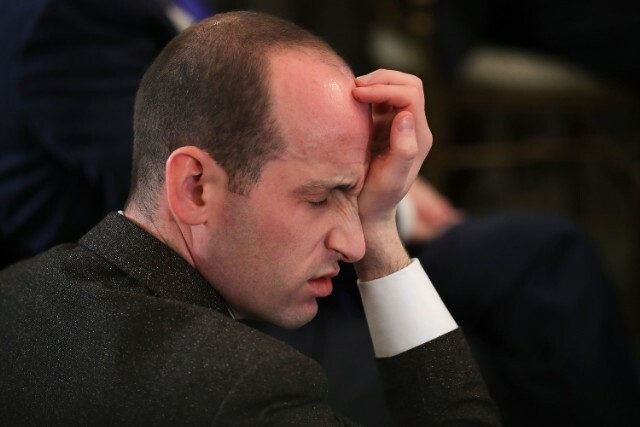 But as the reporter Jennifer Epstein noted on Twitter, Jim Lo Scalzo of the European photo agency EPA snapped pictures that clearly show what’s going on: Miller’s eyes are fully closed, his lips hanging loosely, his head drooping perilously close to his lap. We don’t have the rights to show the EPA’s images on our page, but you can take a look at their watermarked versions here and in the tweet below. It’s unclear for how long Miller was sleeping, but even for just a few seconds, it’s not a great look to be doing it when the topic is even tangentially related to murdered children. Still, we feel for him: He’s a strong contender for the most odious person in an administration full of people vying for that title, and we can only imagine how exhausting that must be.